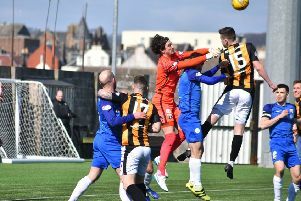 East Fife midfielders Kyle Wilkie and Mark Lamont are to follow ‘keeper Ryan Goodfellow out of the door at Bayview. Bayview boss Darren Young is moving swiftly to mould his side ahead of the new campaign and says on-going fitness issues surrounding the midfield pair have contributed to his decision to release them. He said: “We spoke with Ryan and have just decided to go in a different direction. “With Kyle and Mark it’s more of a fitness thing. However, the manager is keen to retain a large bulk of his squad and has offered new deals to Kieran Millar, Chris Duggan, Craig Watson and Aaron Dunsmore while Scott Linton, Kevin Smith, Chris Kane, Pat Slattery, Mark Docherty and Jonathan Page are all contracted through next season. More in Wednesday’s East Fife Mail.